Missy Everett and her team from Alabama donated more than 60 soccer balls as well as soccer uniforms for Project Sustain Kenya. Thanks for your help Missy! So amazing to have someone like Missy who is willing to take the time to help this great cause. 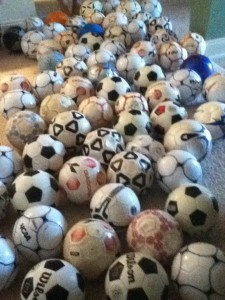 Many kids in Kenya are without and have never had a soccer ball of their own. They will be overjoyed to get these. Thank you! Very well done Missy.The kids will really enjoy the game.This will produce the soccer players for Kenya in the future..
Hello Kate. This is a great endeavor for this region of Kenya. I applaud all those willing to go to these lengths to help our fellow brothers and sisters in sustaining a better life. My partner and I have a private diversified financial services company where we have been representing multi national projects in Non G-7 countries now for 24+ years. There is no better resource than the IFC’s experience in these markets since 1956. As the number one funder of micro finance institutions, banking, infrastructure, sustainable employment, etc they could be a true resource for you. For every dollar donated they could match with three in addition. Over the many years we have consulted and aligned groups like “Going Beyond Borders” with sustainable plans for infrastructure developments they are trying to achieve. As you walk through African and others you see the tombstones of NGO’s that dot the landscape due to poor sustainability planning, and lack of strong financial and training foundations. We currently have business enterprises in Ghana and North Western Africa where we have gained much in just personal experience on the ground. Thank you for what you doing, and if I can be of any assistance please let me know.